Two runners at Geelong on Sunday including Living Dangerously on debut. Living Dangerously is in race two, the 3YO Fillies Maiden Plat over 1200m with Damien Thornton to ride from barrier six. The daughter of Wanted can be quite casual in her trackwork however, Mike Moroney says she is ready to go to the races. “She’s quite laid back but she’s worked well enough to go to the races,” Moroney said. “Her jumpouts have been respectable and it’s a Super VOBIS race so the prize money is excellent but it also means it is a strong race. Bishop Rock (pictured) is the first to go in race one, the Two-Year-Old Maiden over 1100m with Michael Walker to ride and jumping from barrier eight after scratchings. The son of Fastnet Rock pleased on debut when third at Geelong on January 10 and has progressed nicely since. “I can’t fault the way he’s trained on,” Moroney said. “He’s come through the run really well, has kept eating, his shins are good and his action is good. 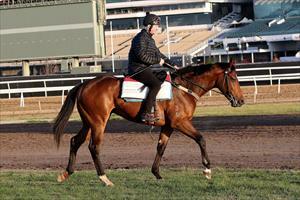 “He’s drawn out wide but has good gate speed so he should be able to get across.